Re-create the dry, highly hopped ale that quenched the British Empire. The story of IPA is one of the most romantic in brewing history — but much of it isn’t true. The first pale ales were exported to India in the late 18th century, and a London brewery called Hodgson was able to establish a near monopoly in the trade. Hodgson was canny enough to let the East India Company’s ships have beer on extended credit. 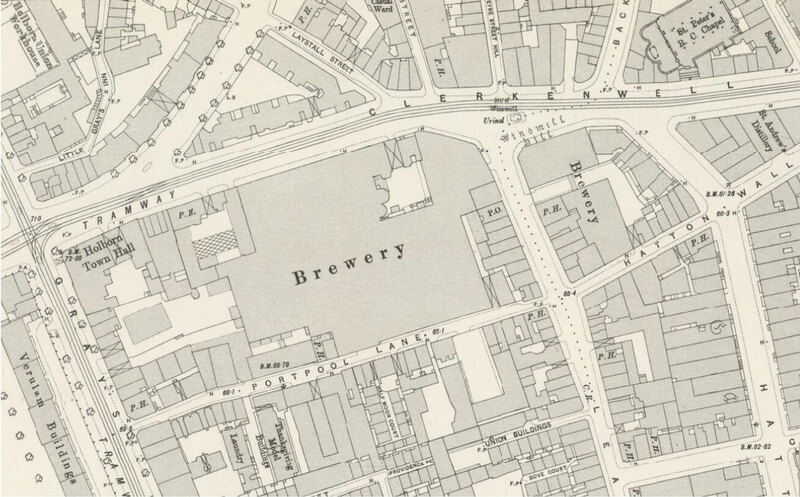 After Hodgson began to demand cash up front, three brewers in Burton-upon-Trent — Allsopp, Bass, and Salt — began shipping the newfangled beer in 1823. The British expats loved it. The beer they exported had several defining characteristics: It was very pale, brewed from only the highest-quality and palest malt. It was heavily hopped, both in the kettle and in the form of dry hops. And it was extremely highly attenuated. This was vital to stop the beer from bursting its casks or becoming infected on the long, hot journey to India. With nearly all the sugars fermented out, there was nothing for any bacteria to eat. The one thing IPA wasn’t was strong, at least not by the standards of the day. 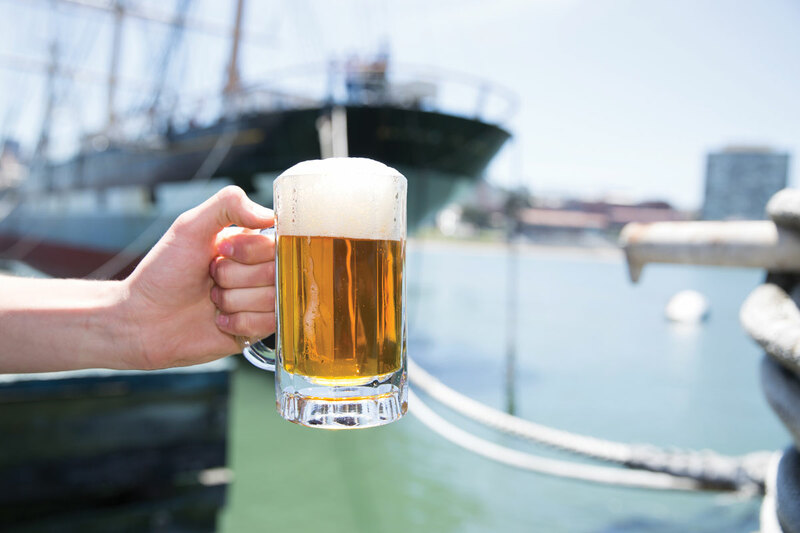 Exports were about 7% alcohol by volume, and domestic IPAs closer to 6% — comparable to mild ales and porters. How did IPA come to be sold back home in Britain? The tale usually told is of a ship bound for India that was wrecked in the Irish Channel. Its cargo was salvaged and sold in Liverpool, where it was a sensation. There’s just one problem. No record exists of such a shipwreck. More likely, demand was created by officers returning from India who had got a taste of IPA. Reid & Co. brewed several pale ales in the 1830s, and this IPA is a real cracker. It’s a typical early 19th-century recipe — just pale malt and lots of Goldings — but all of the hops were fresh. It’s still recognizable today as an IPA, but with a unique character and hop flavor unlike any modern version. I’ve adapted the recipe to a single-mash, single-sparge scheme for homebrewing. Attenuation is about 67% at the time of racking, but IPA was aged in casks for months before even getting on a ship — plenty of time for Brettanomyces clausenii to bring the gravity down and push attenuation up toward 85%. For historical accuracy, the longer you leave it in secondary fermentation the better. 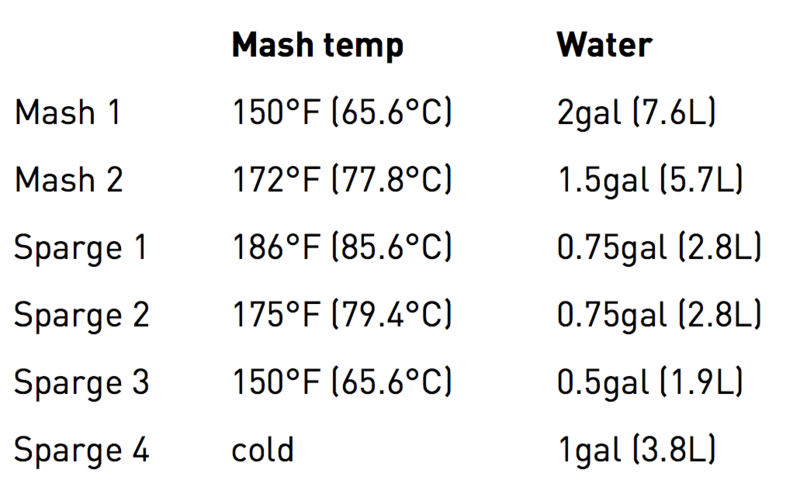 Below is an image of the mashing scheme from the original brewing record. 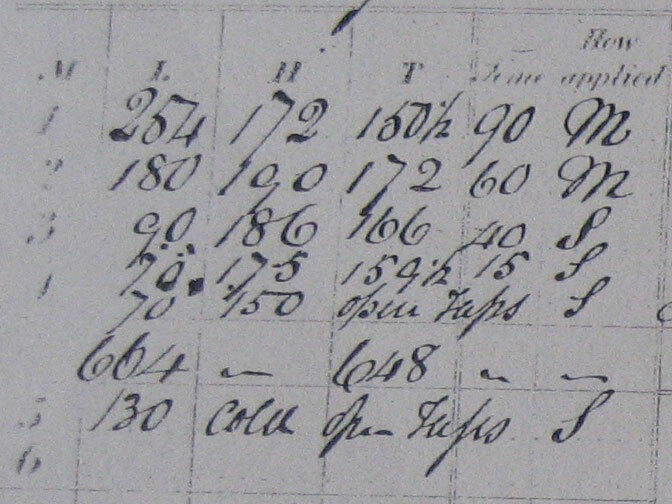 The relevant columns are those headed L (barrels of liquor or water), H (strike heat), T (tap heat), Time (time resting), and How applied (M=mash, S=sparge). You can see that the first mash rested for 90 minutes and the second one for 60. The amount of sparging was unusual in London at the time. It’s not wet hops that are needed, just normal dried hops that are very fresh. If you’re using Goldings, there’s no need to adjust the hopping for today’s hops. The oldest analyses I’ve seen of Goldings — from the 1920s or 1930s — show alpha acid levels the same as today. 5% alpha acid is fine. 19th-century British beers simply had insane levels of hopping. The original had a pretty hot and fast fermentation: pitched at 61.5ºF, rising to 76.75ºF. It was in primary for just 62 hours. Looking at the brewing record, I can see that it was vatted after primary. The longer you leave it in secondary fermentation the better. Bass aged their export beer for 9 to 12 months in cask before shipping it. These beers, especially when exported, often ended up bottled. Prime your bottles in the normal way. Reid & Co. brewed at the Griffin Brewery in Clerkenwell, London, from 1816 to 1898. The 1839 Reid IPA is a bit of an oddity, because Reid was really a porter brewery and a couple of decades later they didn’t brew any ales at all, just porter and stout. 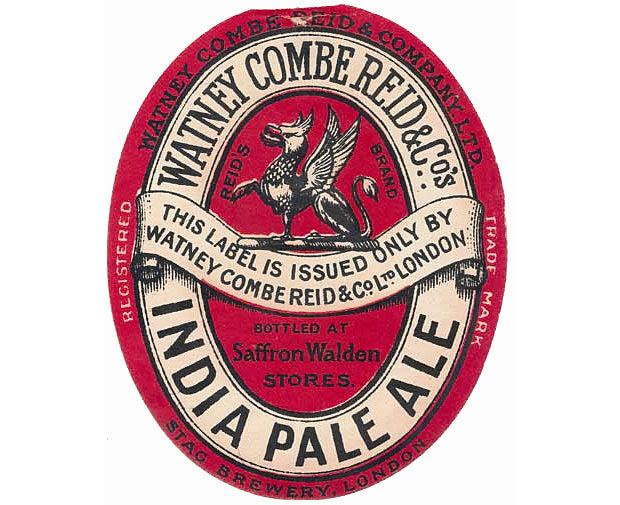 The brewery merged with two other London breweries in the 1890s to form Watney, Combe, Reid. Production was concentrated at Watney’s Stag Brewery (close to Buckingham Palace). Reid’s Griffin Brewery was demolished and replaced by a block of flats. A sad end for a brewery which in the 18th century had been in the top ten largest breweries in the world. This article is adapted from The Home Brewer’s Guide to Vintage Beer (Quarry Books, 2014). Mash tun or muslin bag, 10gal Make a DIY mash tun from a 10gal Igloo cooler, or use the “brew-in-a-bag” method instead. Ronald Pattinson is a brewing historian, member of the British Guild of Beer Writers, and author of the blog Shut Up About Barclay Perkins. Beeradvocate.com calls him “one of the finest and most illuminating beer historians,” and he has collaborated on new batches of old beers with a variety of beer bloggers and craft brewers. He is based in Amsterdam.